I've written about Anders Nilsen quite a bit at The Oxen of the Sun and elsewhere. I've tracked Big Questions to its omnibus publication, featured Rage of Poseidon after picking up a copy from Nilsen himself at the Brooklyn Book Festival, and reviewed a number of titles at the former about.com Contemporary Lit site (compiled here). Most recently I wrote about sketchbook-compilation Poetry is Useless in the Fall 2015 print issue of Rain Taxi. 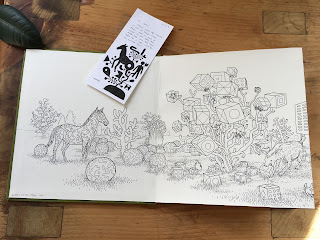 When Nilsen announced that he was working on a coloring book called A Walk in Eden, I was excited to see the finished product but was a little skeptical to see how it fit in the with the rest of his body of work. But, of course, the book is exceptional and despite its ties to what may be a waning coloring fad it persists as a standalone piece. A Walk in Eden is a mesmerizing vision of meticulous line-work and fantasy: flowers bloom into crystalline root systems, Orangutans ride elephants with dinosaurs in the distance and mangroves sprout from the backs of giant lizards. It's playful and expansive and, in my opinion, too perfect to color. Last fall, Nilsen announced a handmade accordion book of a single 12-panel panorama from A Walk in Eden. (The trade edition ended up chopping up these continuous landscapes into multiple pages.) Measuring 10 feet across, this artist's book edition of A Walk in Eden presents Nilsen's work as it was originally created. It's absolutely stunning and would not be out of place in a vitrine at a gallery or museum retrospective. The book is $100 and in an edition of only 20 copies. I'm stunned that there are still some available. Any fans of his work should try to pick one of these up before they're gone. Go here to purchase (the site says there are only 13 left). Further, it's really important to support these kinds of handmade flights from artists. Selling through an edition of 20 books sends a message that there's a market for these things and will inspire anyone to make more work. It's also so good to see that an artist like Nilsen still has the passion to make things. When I first discovered his work around 2005, it was a time of miniature staple-bound books and I think of this accordion edition as a return to those days. It's such a special piece that cuts through contracts and global distribution - it's just an artist making something beautiful, and that's worth every dollar.